Today’s smart technologies can greatly enhance the use of any space—if you know how to deploy them. Willett Systems can integrate today’s electronics and services into a single automation system that’s easy to use and custom-designed to meet your needs. Would you buy a television that does not have a remote control? How about a TV that would require manually changing the channels, adjusting the volume, or turning it off? Why not have all the electronic systems in your home work the way your television works? After all, it’s not the 1970’s. With the current generation of home automation equipment and the Willett team’s experience, your entire home can become as easy to use as your TV. It’s 6:00am. The music turns on in the master bedroom and the lights slowly turn on to the “morning” lighting scene in the master suite, hallways and the kitchen. In the master bath, the TV turns on to a favorite news channel providing weather and traffic updates. At 6:30am, the music turns on in the kid’s bedrooms, and the lights turn on to the “kid’s morning” scene. As everyone gets ready to leave the home at 7:30 (usually behind schedule), mom recalls how she used to hurry around the home turning off TV’s, lights and anything else left on during the morning rush. Not anymore. That’s because we have programmed the home to turn off all lights, TV’s, music, set the heating and cooling system to an away mode and activated the alarm with the press of one button on the keypad in the garage. It’s the afternoon. Everything ok? The afternoon sun is hot. It’s that time of year where it makes sense to close the shades to make the home easier to cool. The shades have been lowered, and the heating and cooling system has turned back on at 3:00pm anticipating the children’s arrival home by 4:00. That’s energy saved. At 4:00pm, the kids arrive home from school. 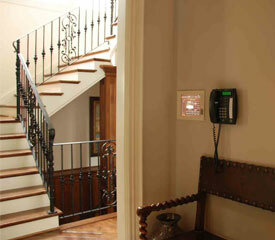 The home automation system texts or emails mom and dad when the alarm has been deactivated. This lets them know that the kids are safe at home without interrupting an important meeting during the work day. The system also has security cameras that can be watched live or the recorded video rewound from an internet connected computer or iPhone. No more rushing home to meet the police for a false alarm. Mom and dad can view their cameras over the internet to check on things if necessary. At sunset, the outdoor lights are activated. The systems knows what time of year it is so the lights are adjusted as it stays light later or gets dark earlier. After dinner, the family heads in different directions. Mom and the daughter want to catch up on their favorite show in the family room while dad and son want to finish watching the baseball game from last night in the media room. With video distribution and Digital Video Recorders (DVRs), everyone can watch what they want, when they want to and where they want to. It’s video anywhere. This evening though, it’s getting late again so dad pauses the game in the media room and decides to go upstairs to finish watching it there. Today’s home automation systems put your music, television and movies wherever its needed. No more searching the house for that favorite CD or DVD only to find out that it’s not in the case. Tonight, mom has decided to wind down for the evening by listening to some of her favorite artists. With the press of a button on a keypad, touchpanel or remote control, she accesses the music on the whole house media server to start a playlist in both the master bedroom and master bathroom. There’s audio everywhere as music fills the rooms. It’s time for bed. The kids want to keep surfing the internet, but it’s late. The kids’ monitors are plugged into outlets that are programmed to go off at 10:00pm. No more surfing. No more chatting. Just before mom and dad go to sleep, one of them reaches over and touches one button on a remote next to the bed. All of the lights in the home go off according to “goodnight” scene. A couple of “night lights” have been left on and adjusted to a low level for those late night trips to the kitchen or bathroom. All music and televisions in the home have been turned off with the press of that same button. The alarm is set in the home mode which means the motion detectors will not be triggered with movement. The family is secure always. Whether its audio everywhere, video anywhere, security always or energy saved the automated home is here and now. With over 100 years of system design, project management, installation, and programming experience Willett Systems staff will be able give you a system fine tuned to meet your needs now and into the future.